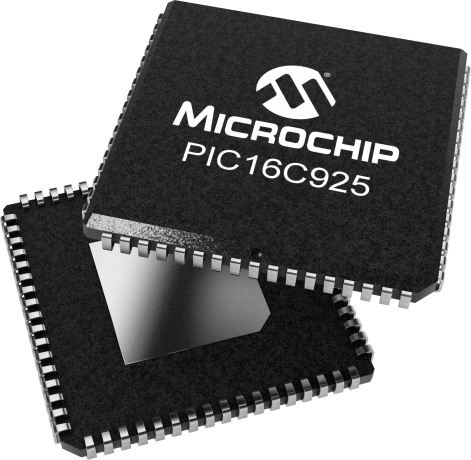 This powerful (200 nanosecond instruction execution) yet easy-to-program (only 35 single word instructions) CMOS OTP-based 8-bit microcontroller packs Microchip's powerful PIC® architecture into a 64- or 68-pin package. The PIC16C925 features an integrated LCD driver module - capable of driving 32 segments and 4 commons for LCD display and 5 channels of 10-bit Analog-to-Digital converters. The synchronous serial port can be configured as either 3-wire Serial Peripheral Interface (SPI™) or the 2-wire Inter-Integrated Circuit (I²C™) bus. Easily adapted for handheld meters, thermostats, home security and power/gas/water meter products.